Biology faces a basic paradox - life requires DNA to function, yet DNA evolved after life emerged. Now a study of modern bacteria has revealed what DNA's progenitor might be. Until now, RNA was mostly dismissed as DNA's lackey, a messenger and intermediary between DNA's complex instruction manual and the creation of life's essential proteins. But Yale researchers discovered that the pathogenic stomach bacterium Clostridium difficile possesses more complex RNA structures that are able to detect molecules and control the expression of certain genes - abilities previously thought to be the sole domain of DNA and proteins. These structures, known as riboswitches, form a combo of two small and two large RNA molecules that together regulate the function of ribozyme, a structure that biologists once thought existed only to reproduce itself. However, in the stomach bacterium, this ribozyme helps influence gene expression, apparently to help the bacterium better affect human cells. 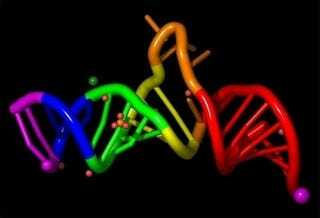 Although this is a relatively limited function, it's a good indication that more ancient RNA structures could have done many of the jobs that are now exclusively carried out by DNA, allowing biologists to more easily envision life before DNA. "What these cells are doing is using ancient RNA technology to control modern gene expression. They were though to be molecular parasites, but it is clear they are being harnessed by cells to do some good for the organism. A lot of sophisticated RNA gadgetry has gone extinct but this study shows that RNA has more of the power needed to carry out complex biochemistry. It makes the spontaneous emergence of life on earth much more palatable."